In the battle for the Chinese smartphone market, Apple has lost ground in both marketshare and shipment quantities to smartphone manufacturers Vivo and Oppo, new data reveals. The study, generated by Strategy Analytics, claims that vendor shipments by Apple dropped from 9.7 million to 7.3 million from the second quarter of 2015 to the second quarter of 2016. The drop in sales because of mixed demand for the iPhone 6s in the Chinese arena led to a decrease in overall marketshare from 9.2 percent in the year-ago quarter to 6.7 percent currently. The gains realized by China-native Vivo and Oppo are credited to improvements in device quality, greater retailer penetration, and rising brand awareness among consumers. In the same time period as Apple's decline, Vivo rose from 7.4 percent of the overall marketshare, to 11.9 percent. Oppo climbed from 6.9 percent to 13.9 percent. In a year with the China smartphone shipments growing 3.7 percent, the country remains the world's largest market for the devices. 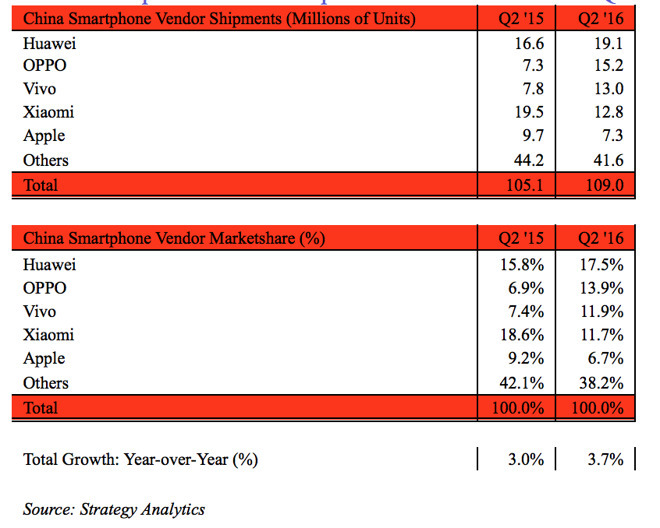 China accounts for one in three smartphone shipments worldwide, according to Strategy Analytics. 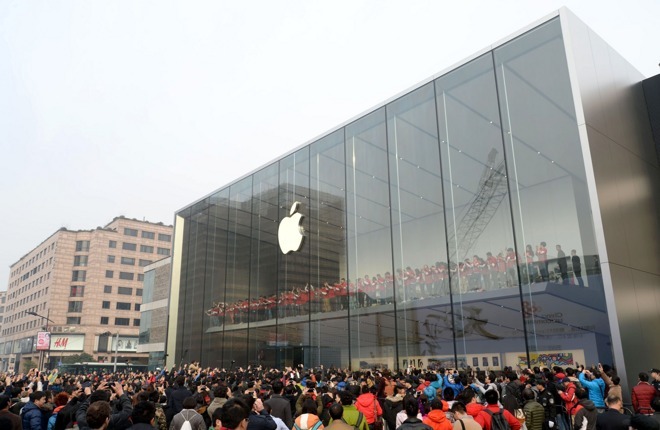 In the latest set of Apple quarterly results, revenue from Greater China came in at $8.85 billion, a decrease of 33 percent from the same quarter last year. Revenue decreased both from the decrease in sales in the quarter, as well as the depreciation of the Chinese yuan against the dollar. "In the first three quarters of this fiscal year, our total revenue from Greater China was almost $40 billion," Apple CEO Tim Cook said, regarding the Chinese marketplace. Cook noted that revenue was "up 55 percent from the same time frame just two years ago, while iPhone units were up 47 percent."